WP Fusion integrates with The Events Calendar and Event Tickets by Modern Tribe, letting you add contacts to your CRM and apply tags when guests RSVP for events. 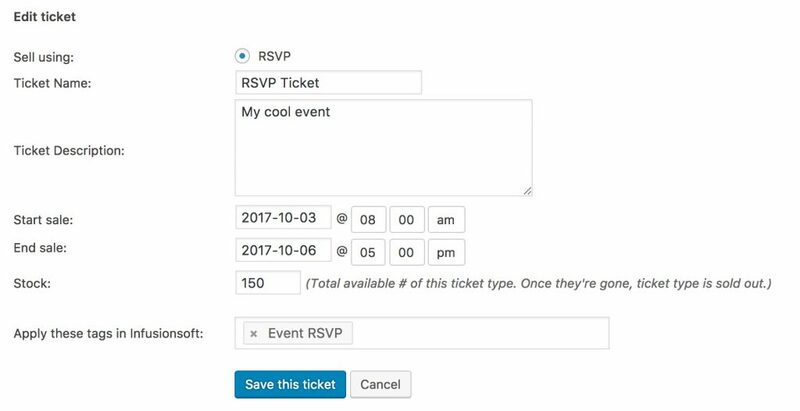 When adding a new ticket to an event, you’ll see a new option to select tags to apply. When the guest makes an RSVP to your event, their contact information be sent to your CRM, and any tags specified here will be applied. With Event Tickets, attendees can be moved from one event to another. If this happens, the tags from the original event will be removed, and the tags for the new event will be applied. WP Fusion also lets you sync the event date, time, and location to the contact record, so this data can be merged into emails. See below for an example. Event Tickets Plus allows for even more flexibility with creating events. You can sell tickets to events using Easy Digital Downloads or WooCommerce, and collect additional information about attendees during the registration process by adding custom fields to the ticket settings. Any custom fields added to an event will show up under the Contact Fields section in the WP Fusion settings page. You can then map these to fields in your CRM and record relevant attendee information. Watch this video from WPLaunchify about connecting Ontraport to Event Tickets / WooCommerce with WP Fusion.